Organic. 100% pure from organic trees to your table. 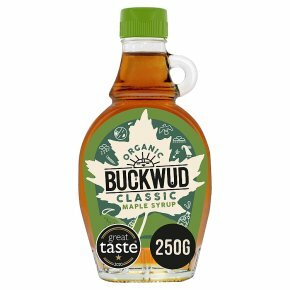 Suitable for vegetarians and vegans.100% Pure & Organic Canadian Maple Syrup - No1 Medium With its amber colour, Buckwud Organic Maple Syrup has a typical maple flavour with buttery caramel and mild smokey notes. Buckwud Organic maple syrup is the perfect brunch partner to bring natural and tasty sweetness to your dishes. Absolutely delicious on pancakes, waffles and ice-cream, it is also great to sweeten coffee.